All students must sign up and pay for class in order to reserve your spot! Kit must be purchased at Sew This! includes just about everything you need to get started. 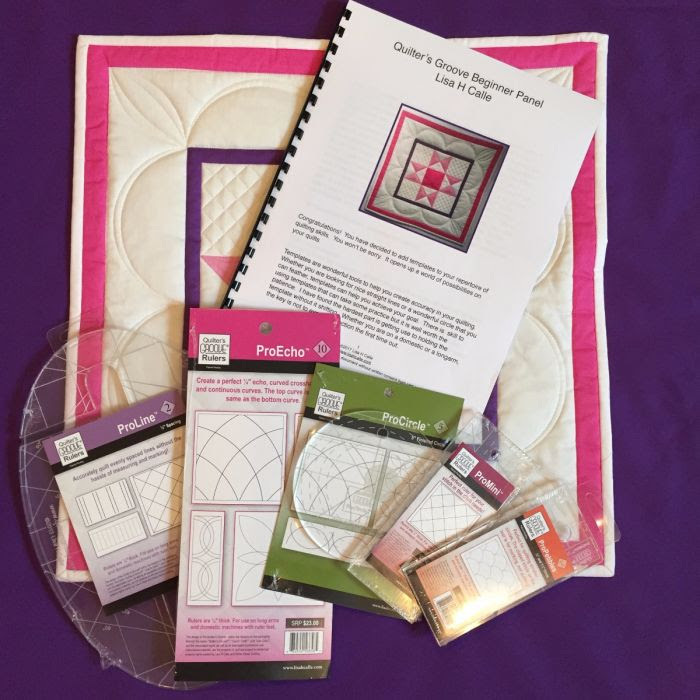 Cody is going to go step by step on quilting this great panel that come with the kit. The beauty of the kit is it includes videos that also go step by step on quilting the panel. 1 fat quarter for backing, fat quarter sized batting of your choice, Handi Grip to keep rulers from sliding, thread of your choice (i used a light to medium Isacord), and quilting gloves can never hurt. All supplies can be found here at Sew This! 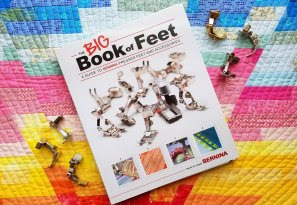 Only Supplies needed is a notebook, pen, and The Big Book of feet if you have it by BERNINA, and B475 Machines will be supplied. When life gives you rainy days, why not wear cute boots and jump in the puddles? 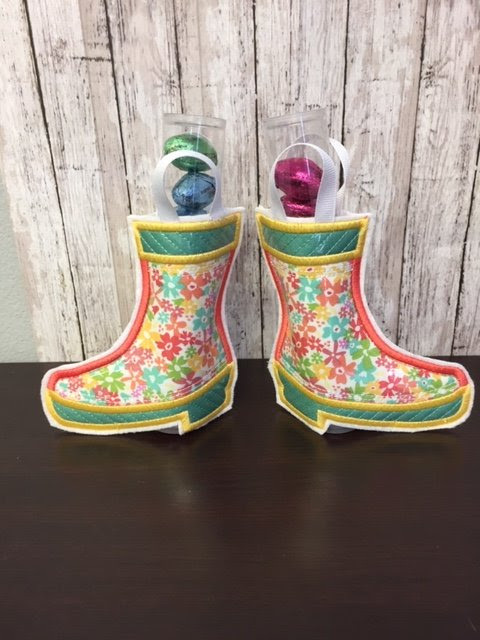 Or, just stay inside and stitch a pair of darling rain boots on your embroidery machine. A layer of vinyl makes happy cotton prints appear lie real rubber boots. Kimberbell's Medium Sweet Tube slips inside each boot with darling ribbon straps. To encourage a friend who is weathering the storms of life. Kit does not include tubes! Come in on this Saturday and see the demo on this months Kimberbell Club and receive the design. 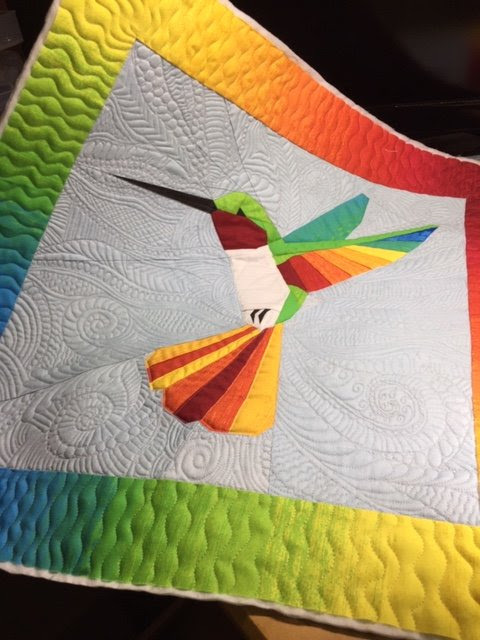 Denise has been hard at work on this beautiful quilt, for those of you who were able to get their hands on the first set of quilt kits come join us on those days to work on you quilt. For those of you who have other embroidery projects you need to work on feel free to come and join the fun on these three days. Bring your projects and lets make a day out of it. 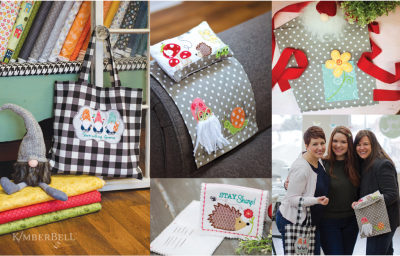 Kimberbell’s all-new decorative quilt features a cheerful assortment of applique and embroidered blocks including homes of all shapes and sizes, a cozy couch, sofa, and loveseat, floor lamps, chenille potted plants, and sweet sentiments. You’ll learn fun embroidery techniques and enjoy traditional piecing with each block. With over more than 20 embroidered blocks you can choose between eight embroidered houses—from your first apartment building, to a two-story in the suburbs, then grandpa and grandma’s farmhouse, even a retro RV. 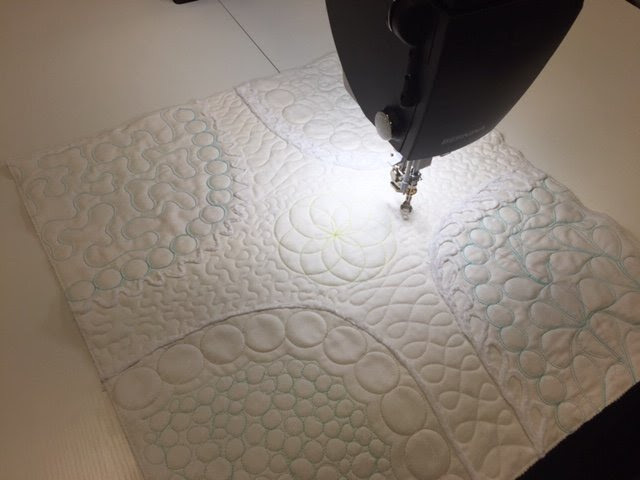 Quilting with the BERNINA Q20. Come discover the wonders of quilting your own quilt on the fully stitch regulated BERNINA Q20. We will be Quilting with twin needles, chenille couching, a few different rulers and more. All of which will have beautiful stitches effortlessly with the built-in dual stitch regulators. Come join the fun. seating for six. 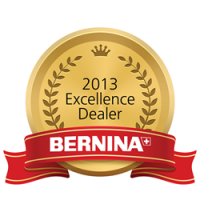 Special Saving on the the BERNINA Q Series if your interested during this time! Make sure to bring your machine, Sew This toolboxes will be at each station so no need to bring your sewing room with you, just your machine and LUNCH!!! This is such a cute project and a great confident beginner paper piecing project. Some basic knowledge of paper piecing is required for the class. 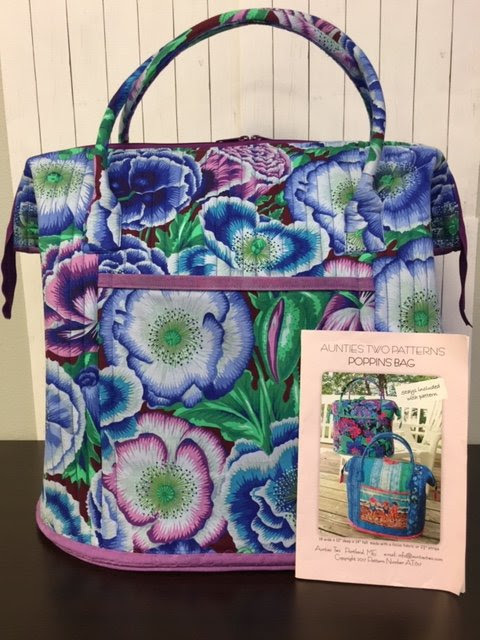 Large zipper top bag great for all of your magical stuff! Two pockets on the outside and inside keep everything organized. Structural stays keep it in shape. Use a focus fabric and channel stitch the body of the bag. Pattern includes 2 stainless steel metal stays. We also have 12 months financing available all year long, so pay for your BERNINA with time.